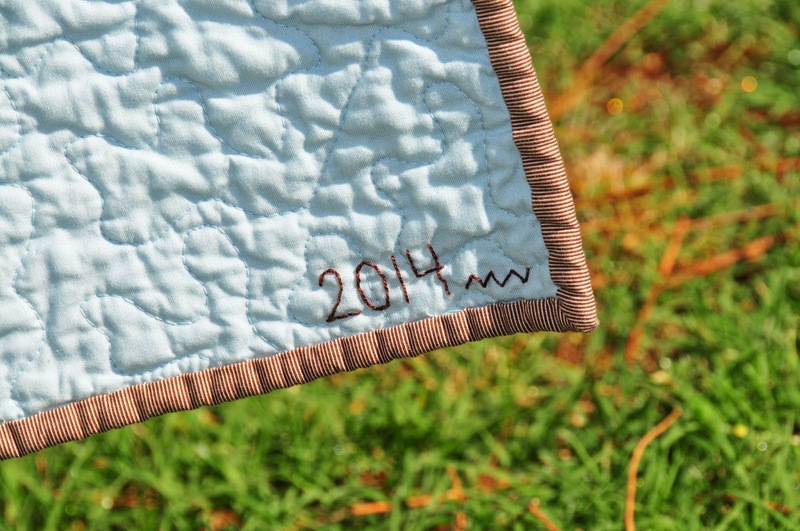 If you follow my blog, you may have seen this one before, but it's my fave... My Diamond in the Rough Quilt! I think this design is sometimes also called a kite shape, but they look like diamonds to me. Same diff, right? Anyways, I made this quilt using some Innocent Crush fabric by Anna Maria Horner that I had in my stash, along with some Kona Cotton in Ash. I really love how the color pops with the grey. 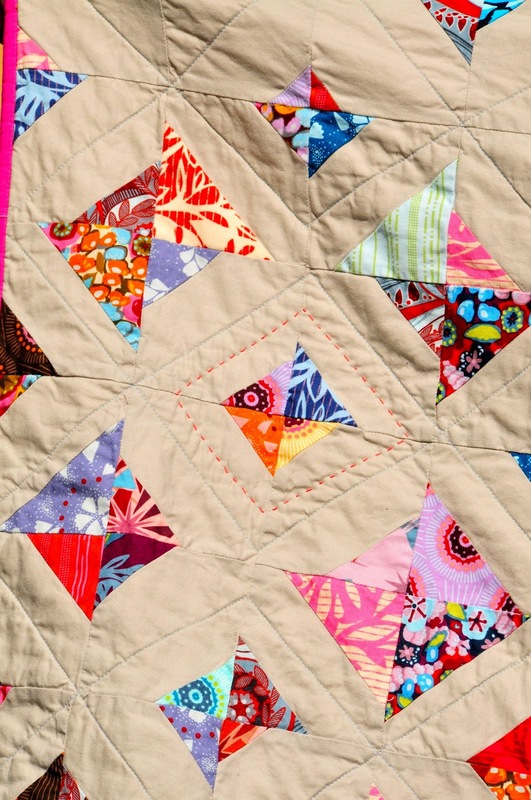 However, my favorite part of this quilt is that none of the diamonds are perfect. They are all wonky and it looks so fun! 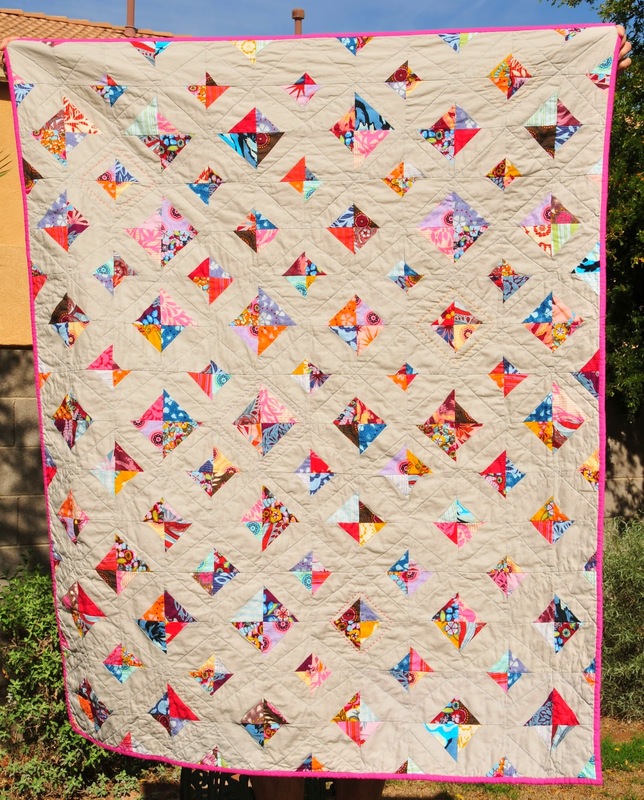 :) I did some wonky diamond machine quilting, along with a few hand-quilted diamonds, using Anna Maria Horner's line of Pearl Cotton thread. I kept the back pretty simple by making some coins of more Innocent Crush in between some more Kona Ash. I used a pretty hot pink solid for the binding. 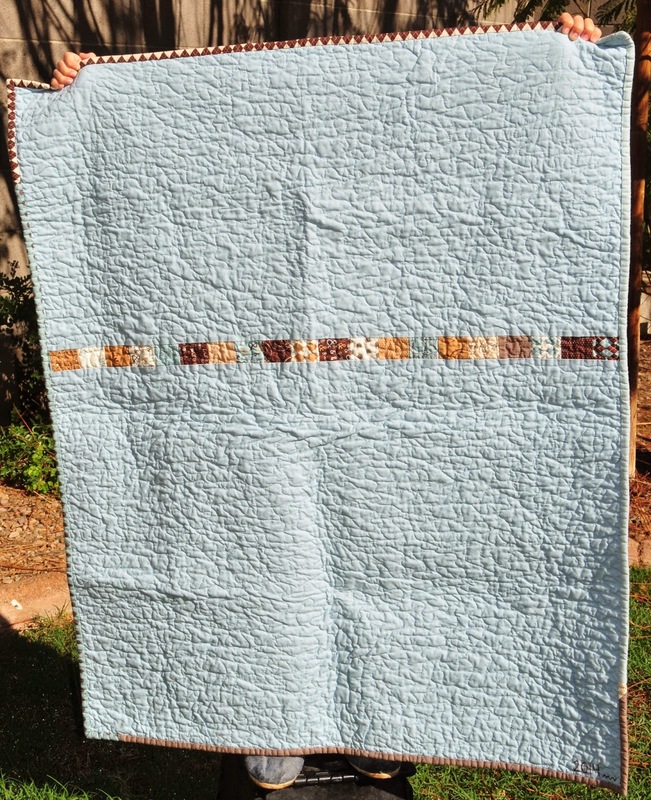 It's one of my favorite quilts! Did I say that already? ;) Oh well! Enjoy! And if you have a chance, stop on by Amy's blog and check out all the beautiful entries for the Blogger's Quilt Festival! :) Have a great week! I finished this quilt over the weekend. 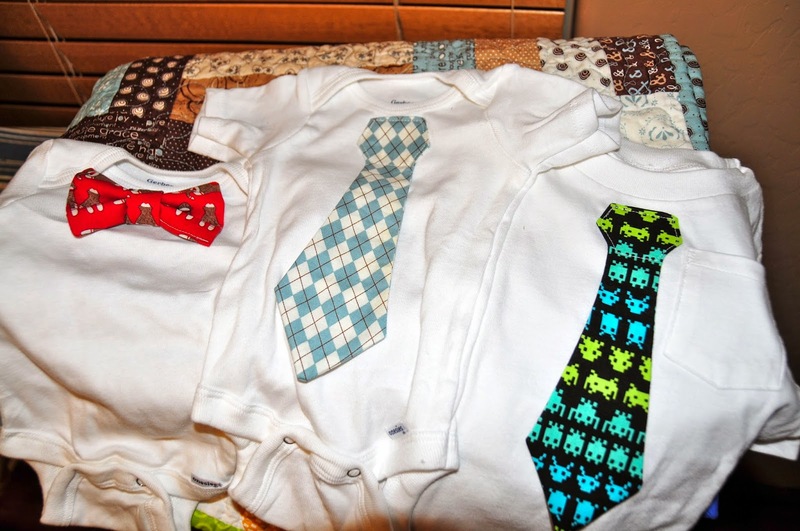 It will be for my cousin's baby boy, due in August. It was really easy to put together for two reasons. 1. 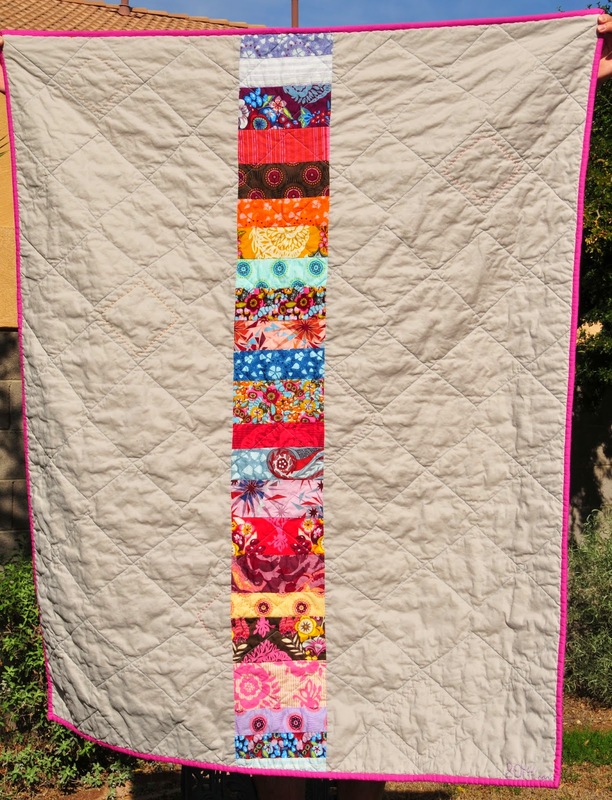 It was made using a jelly roll, so not as much measuring and cutting. 2. 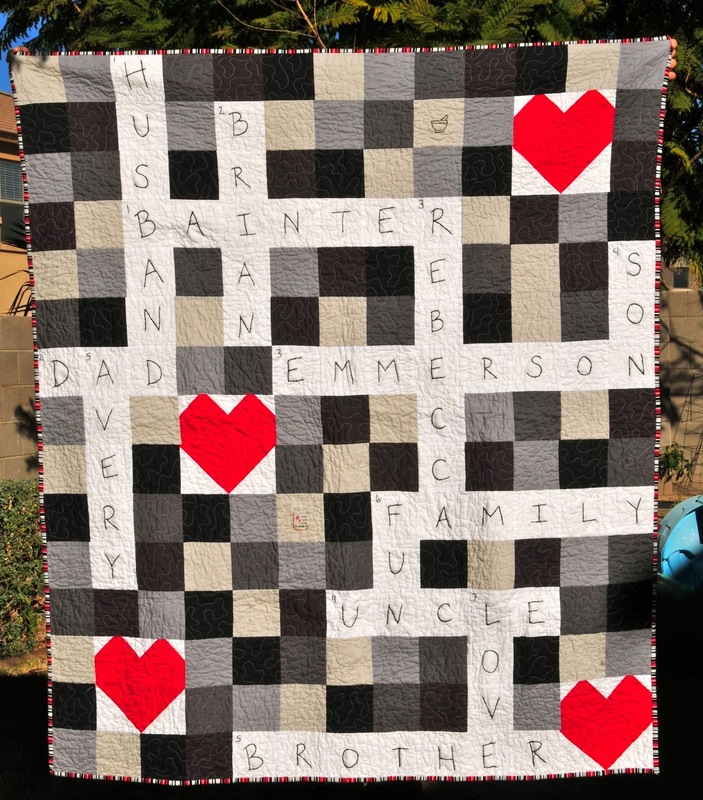 It's a baby quilt... so much smaller! 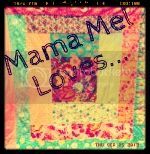 :) I actually love this design and hope to do some more similar quilts in this way. I used the Pure fabric collection by Sweetwater. I've had the jelly roll in my stash for a while. I love the blues and browns, and the cute little words. And argyle! So, I guess the blocks are essentially a rail fence design, although I didn't line them up all perfect in a zig zag or other design. I was a bit more random with them, because it's funner that way. ;) Yes, I said "funner". Anyways, to make 5 blocks, I took 4 jelly roll strips (approximately 2.5"x 42" each), sewed them together, pressed, then cut them into 8" squares. Easy peasy. Repeat 6 times to get 30 blocks. I had leftover strips to use for the binding, and little 2" squares to use for the pieced backing along with some matching baby blue. This could easily be done in a day, if you don't have anything else to do. For me it took maybe a week. Lol! Yeah, I was busy. Catching up on blogging... again! Sorry it's been so long... again! I have such a hard time finding time to get on the computer. 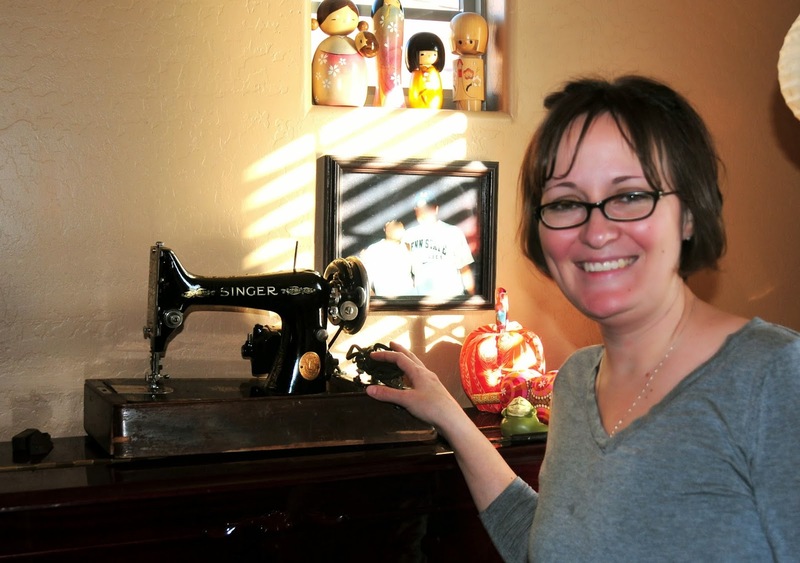 I've been keeping busy with lots of sewing. I've lost track of how many quilts I have in progress now, but I've finished 2 quilts this year already. :) I know it's late to think about the new year... pretty soon it will be the middle of the year! 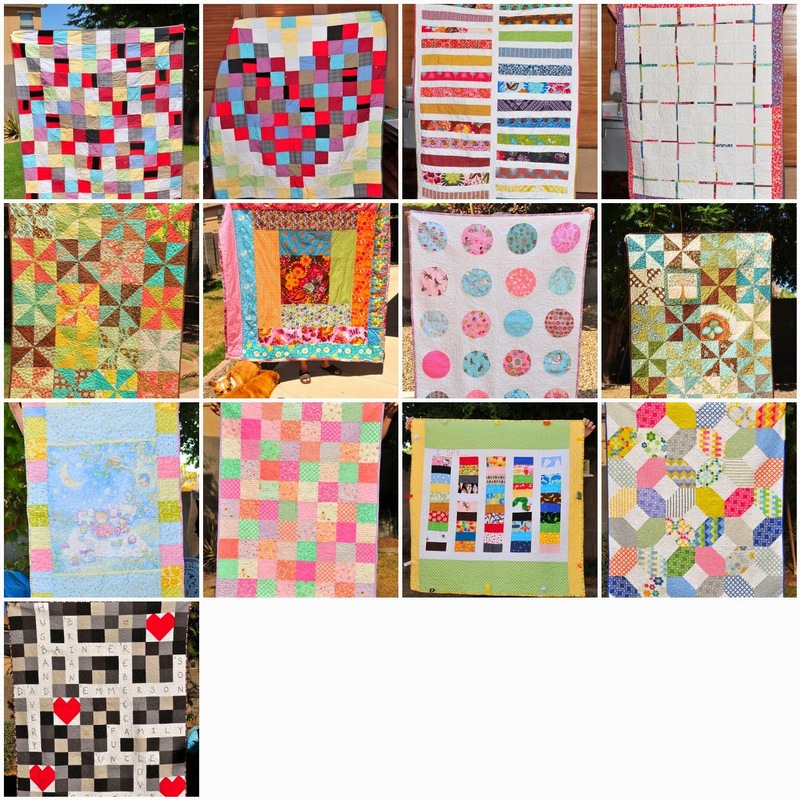 But, here's a little mosaic of the quilts I finished in 2013... 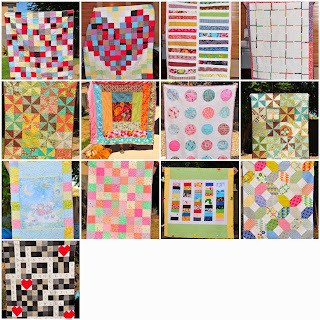 I ended up making 14 total quilts (the mosaic shows 13, but I made 2 of the "Grandpa Quilt" for my 2 uncles). I love seeing the year's work this way. I know I made way more than just quilts, but I'm bad about taking pictures of everything I make. I made this Chevron Quilt for my friend in January. 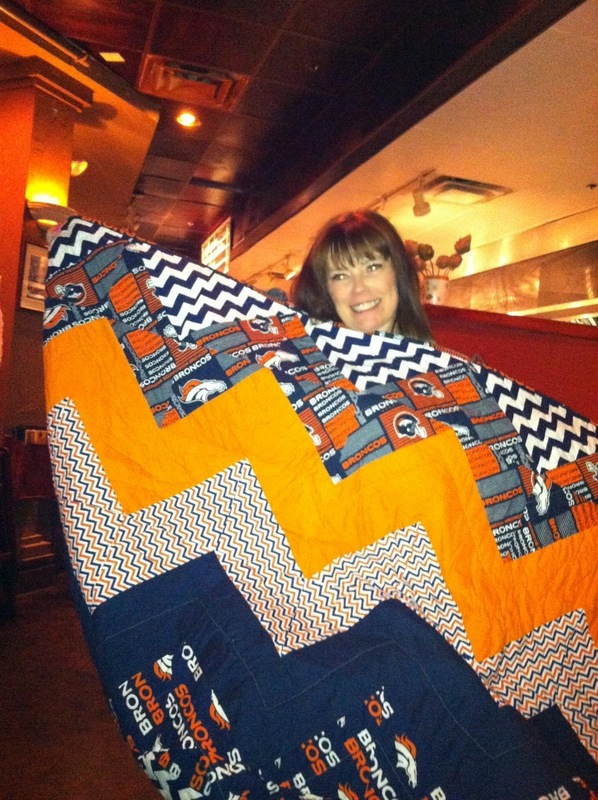 She's a major Broncos fan, and she had the quilt just in time for the Super Bowl. Too bad they lost. :( I feel like I jinxed them. 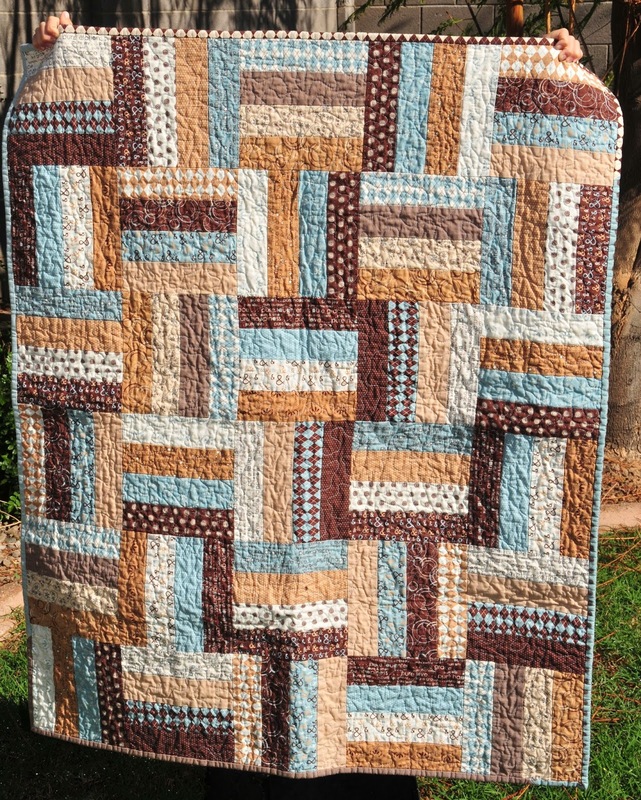 I just finished this quilt over the weekend. I actually started it last year, then got busy over Christmas (as usual), and it got put away for awhile. 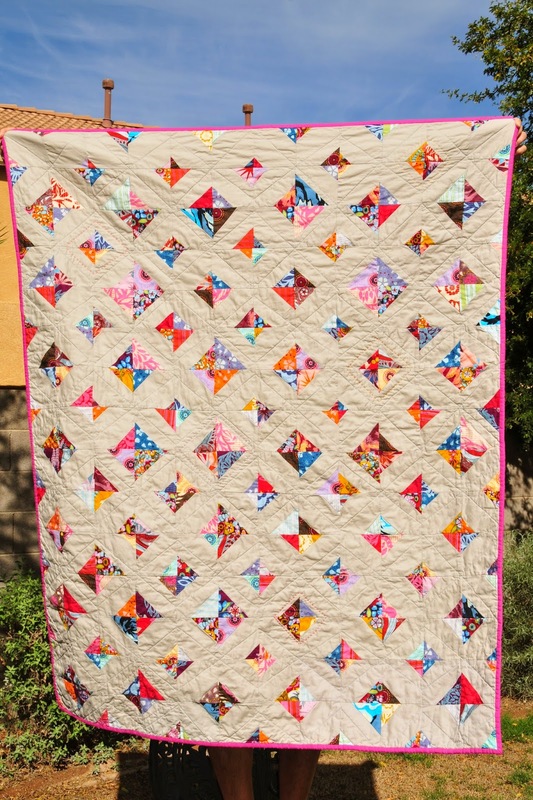 I call it my "Diamond in the Rough Quilt", although I think they might be called "kites" instead of "diamonds". Same diff, though, right? ;) I used Anna Maria Horner's Innocent Crush collection, along with some Kona Cotton in Ash. 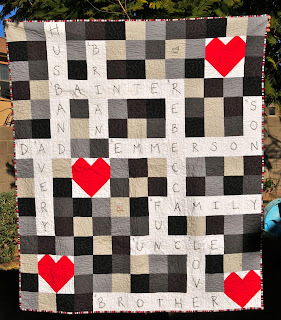 My favorite part of this quilt...? None of the diamonds are perfect. I think it looks so much more fun with them all jagged and wonky! 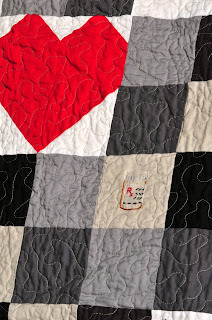 I did a wonky diamond machine quilting along with a few hand-quilted diamonds here and there. I kept the back pretty simple by using more Kona Ash, with some "coins" of more Innocent Crush. I had some solid hot pink that I used for the binding. It looks totally girly! ;) I think this is my new favorite quilt. I'm still trying to decide if I should sell it or keep it. What do you think? Hope everyone is having a great start to Spring! I made "scarves for my sisters", using my precious leftovers of Anna Maria Horner flannels and voiles from my giant log cabin quilt. These went to my sister, my two step-sisters, and my two sisters-in-law. I made remote caddy pillows for 3 of my brothers-in-law. Just pillows with pockets, handy for remotes, iPhones, or snacks. ;) Sorry, no pics. I finished this crossword quilt for my brother-in-law, who was requesting a quilt. Really, my sister was requesting a quilt for him, since he kept stealing the one I made for her. :) For the "answers" I used his name, and names of his family, as well as some other things. I embroidered all of the letters, and I also embroidered a couple of pharmacy related items (mortar and pestle, and pill bottle), since he's a pharmacist. 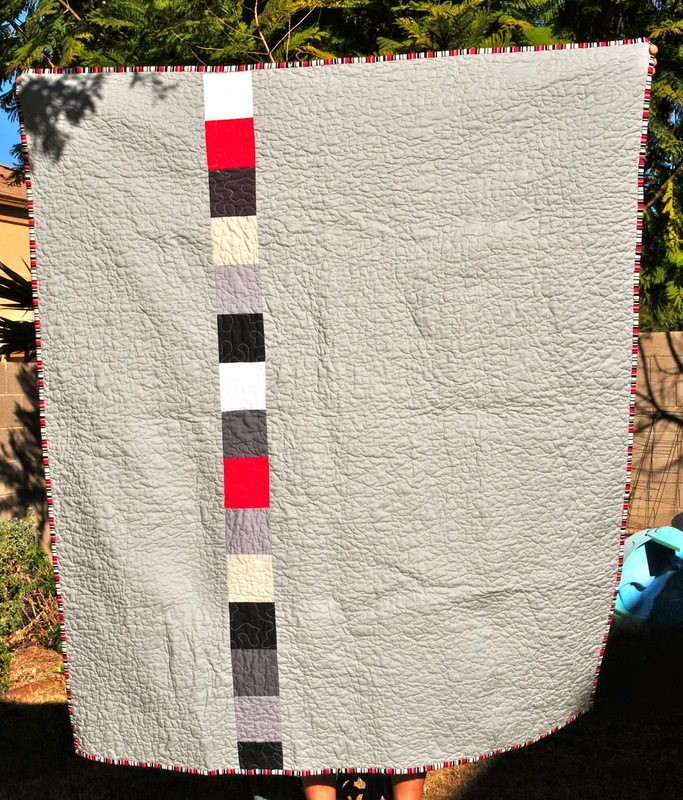 I used a couple of charm packs of Kona Cotton in the Silent Film palette, as well as some white and red. Some of my favorite colors together. I used some Kona Cotton in Ash for the back, as well as some leftovers of charm squares from the front. Here's a close-up of the pill bottle. Of course, I've also been busy keeping the kids occupied. I love when my son is out of school! I usually get an extra half hour to sleep in, and we get lots more time to play. We had to make some cookies for Santa, and my son had his heart set on gingerbread cookies. It was my first time making them, and they turned out pretty good. Really soft too! 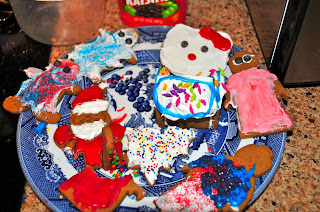 Of course, we loaded them up with sugar so Santa could go into a diabetic coma! Place brown sugar, molasses, cinnamon, and ginger in a large saucepan over medium low heat. Bring to a boil, stirring frequently. Remove from heat and stir in baking soda. Stir in butter gradually, stirring well between additions to combine. Add egg, vanilla, and salt to sugar mixtrure, stirring to combine. Pour into a large bowl and add flour gradually, stirring to combine. Turn dough out onto a lightly floured work surface and knead until dough comes together and is no longer sticky, adding flour by the tablespoon if necessary. Roll out half the dough on a floured work surface to 1/8-inch thick. Cut dough into desired shapes. Place on prepared baking sheet and bake until edges are slightly browned, about 10 minutes. Remove from oven. Let cookies cool on baking sheet for 5 minutes. Transfer to a wire rack to cool completely before decorating. *Note: I halved the recipe, and I made my cookies a little thicker, probably closer to 1/4" thick. They were great! Hope you all have a wonderfully Happy New Year! Wow... 2014! Time flies!